The continually increasing size of hard drives means we can all store more pictures, music, games, and so on, but as with the transistor counts in Moore’s Law, those increases don’t come easy. Companies like Toshiba, TDK, and Seagate are forever looking into ways to increase the number of bits they can store inside a drive. It’s already an astounding amount, but they always seem to find a way to improve it further. Today’s advance comes from Singapore’s Institute of Materials Research and Engineering, where Dr Joel Yang has figured out a way to fit several times the number of bits in a given area. The secret? A little salt in the mix. 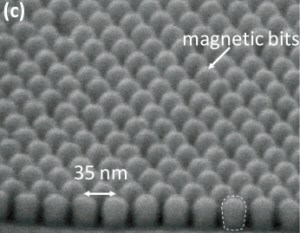 Hard disks have a surface covered in tiny magnetic granules, each only nanometers across. Groups of them clump together to form tiny, semi-regular islands. The hard drive head flies overhead and flips these islands one way or another to create 1s and 0s. Those tiny granules are formed by exposing a certain solution to a nanolithographic process (but of course we all knew that already). Dr Yang found that by adding a bit of salt to solution, they were able to produce superior grains. They’re not actually smaller, but instead of having to clump a bunch together in an island, each individual grain can be manipulated individually into a bit storage unit. This means that the data density of the disk’s surface can be increased immensely. They’ve demonstrated data storage at 1.9 terabits per square inch, which is about four times what the very best hard drives today are capable of. And they’ve made granules small enough that drives based on this new process could reach all the way to 3.3 terabits per inch. That means that your drives could hold as much as 18 terabytes in the near future. Yang actually developed the salty solution when he was at MIT, but it looks like IMRE gets to reap the rewards, at least if they can commercialize it. We probably won’t see drives based on this tech for a couple years, but the improvement is notable regardless. The full paper can be read here.